Growth Of Global Business PowerPoint Templates And PowerPoint Themes 1012-This PowerPoint template shows golden dollar coins with word growth on it. This image represents the concept of global business. It is a useful captivating tool conceived to enable you to define your message in your Business and Financial PPT presentations. Use this template for business development, rise up, growth of indices etc. Our PPT images are so ideally designed that it reveals the very basis of our PPT template are an effective tool to make your clients understand.-Growth Of Global Business PowerPoint Templates And PowerPoint Themes 1012-This PowerPoint template can be used for presentations relating to-"Globe with golden coins, Money, Finance, Business, Globe, Earth" Press fast forward with our Growth Of Global Business PowerPoint Templates And PowerPoint Themes 1012. Give your career a booster dose. You are entitled to excellence. 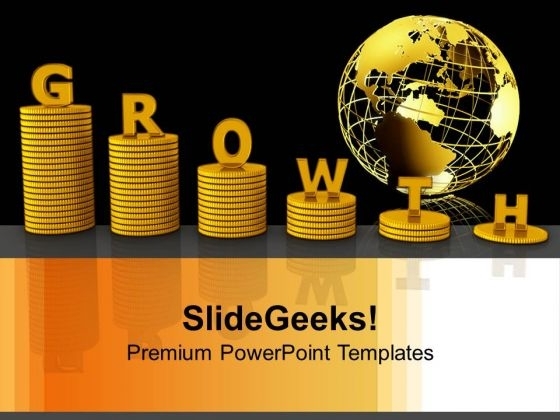 Demand your due from our Growth Of Global Business PowerPoint Templates And PowerPoint Themes 1012.